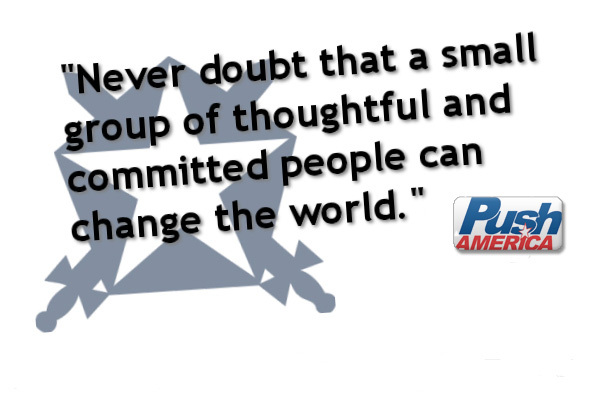 Push America, a 501(c)3 non-profit organization, was founded by members of Pi Kappa Phi in 1977 and remains the exclusive service learning project of the Fraternity, with the purpose of instilling lifelong service in our members and serving people with disabilities. Ingenuity has allowed for Push America to develop premier programming for Pi Kappa Phi undergraduates and alumni. What started out as construction of a therapeutic play unit has evolved into nationally recognized cycling events and construction projects that work collectively to promote a greater understanding of people with disabilities. Members of Pi Kappa Phi have raised nearly $8 million dollars in support of the projects and programs of Push America as well as donated thousands of man hours to renovate facilities that serve people with disabilities across the country. New projects are on the horizon. There are funds to be raised and new Pi Kappa Phi members to educate so they can effectively expose millions of Americans to the mission of Push America. The mission of Push America: Building leaders of tomorrow by serving people with disabilities today.